Guys! After toiling over our foundation garden for years, seriously years, I finally decided that it was time for real change. Not gonna lie, seeing my garden beds torn apart to make way for our new stoop definitely pushed me in that direction. Starting from a meager plant budget about six years ago, I had taken to dividing my perennials every couple of seasons to fill in the front foundation garden. Seeing my DIY punk rawk gardening effort destroyed was especially a bummer after finally getting my perennials and foundation beds to a point where they felt full grown and realized. I was this close to having real curb appeal, and then a bob cat came along, and that was that. I guess I’m being a bit dramatic, it’s not all bad, I was able to save the Hostas and a two of the Heucheras, but I lost all the Hydrangea and one of the Salvia. And lets be real, my plant likes/dislikes have changed, just like my love for Screeching Weasel and stinky basement shows. It just finally felt like this was the time to let the old garden go, plan a new front foundation garden, and invest in some well cared for perennials. So I dug everything up and went shopping! If I can’t have full grown perennials that I have nurtured in my yard for years, then I will have the second best thing, store bought perennials (total sell out, I know!) from a brand I trust. I headed out with my gardening guru, my ma, and we went to our favorite nursery, Tonkadale Greenhouse to pick up a car full of Monrovia perennials. Monrovia has always been a brand I look for, and honestly gush over all of the selections when I go to the flower store. Their plants are always amazingly beautiful, huge, flowering wonderful things, and the selection and diversity is beyond what you find at a lot of other places. I honestly think that other plant brands don’t even compare, this stuff is good. My first experience with Monrovia was years ago when I realized that they grew the most beautiful types of peonies I had ever seen. You could just tell that these were well bred, cared for plants, that were raised to thrive. I’ve been a huge fan ever since. Anyways, I was in the market for some new foundation plants for my front flower beds. I had spent the week prior adding new soil to the beds and removing all the old perennials and debris. Don’t worry, everything got replanted around the yard or given to neighbors. I had a color story I wanted to follow, which included lots of purple and blue-ish greens. I’ve found that these are my favorite colors to go with the dark blue color of the house. My front yard is shaded for most of the morning and then gets partial sun in the afternoon, the left garden gets more sun than the right. I wanted height in the back (towards the house), but I also wanted structure. 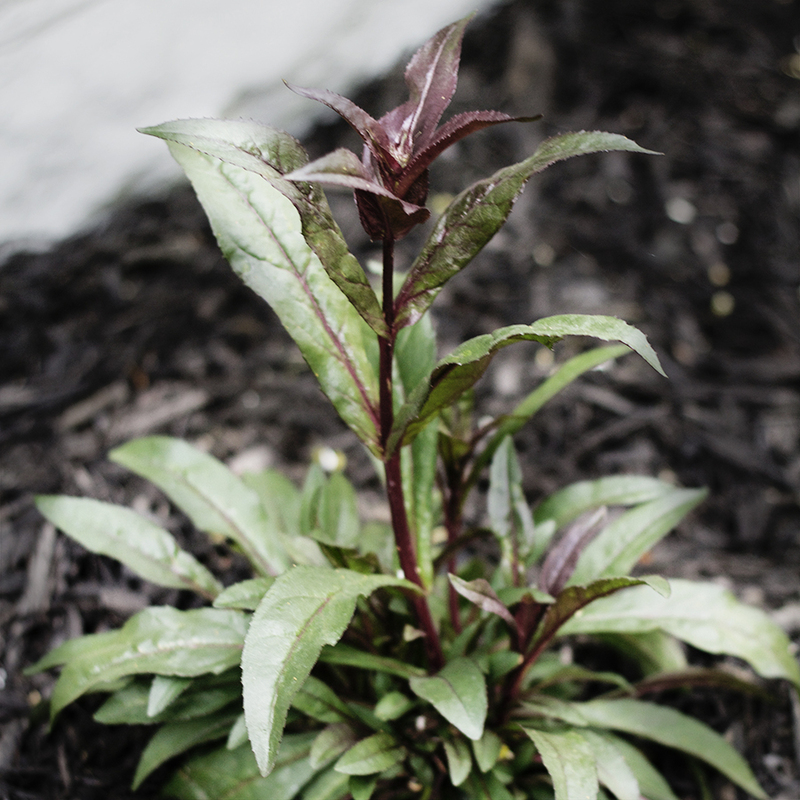 I found the perfect amount of both of these qualities in the Penstemon. I thought including some blue Hosta would be a really good compliment to dark blue siding on the house, and would break up the purple of the Penstemon. 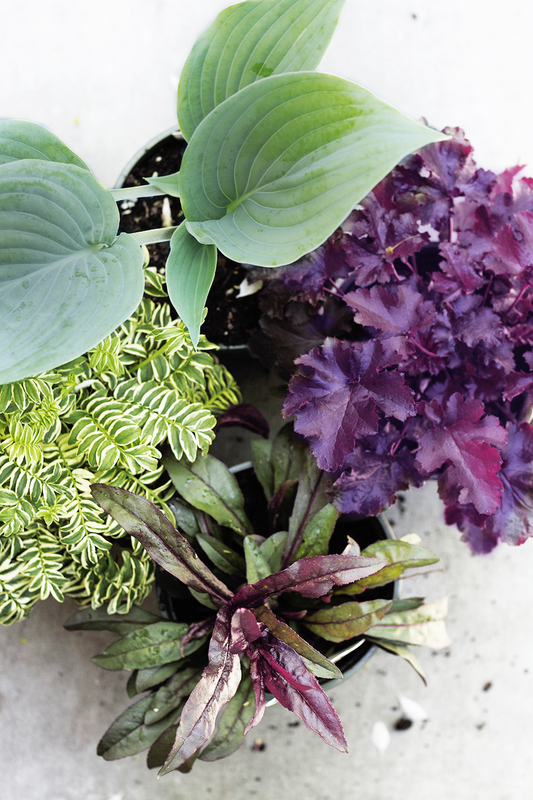 Heuchera and Hosta together are my favorite combination, so I knew I would be purchasing Heuchera too. Lastly, I was looking for some texture and was hoping to find it in some unique foliage, which I did in the Jacob’s ladder. I took sometime to think about what I needed and came up with this basic plan (above) before I went out shopping. Alright, so my spreadsheet-obsessed-husband is rubbing off on me, I’ve been wanting to put a ‘zone 4’ plant database together, including all of the crucial info such as their height, width, color, water needs, sun needs, etc. Guess what you guys? Monrovia already did that! I actually spent quite a bit of time looking through plant catalog using their database, you can find it over here (follow the link and click on ‘plant catalog’). 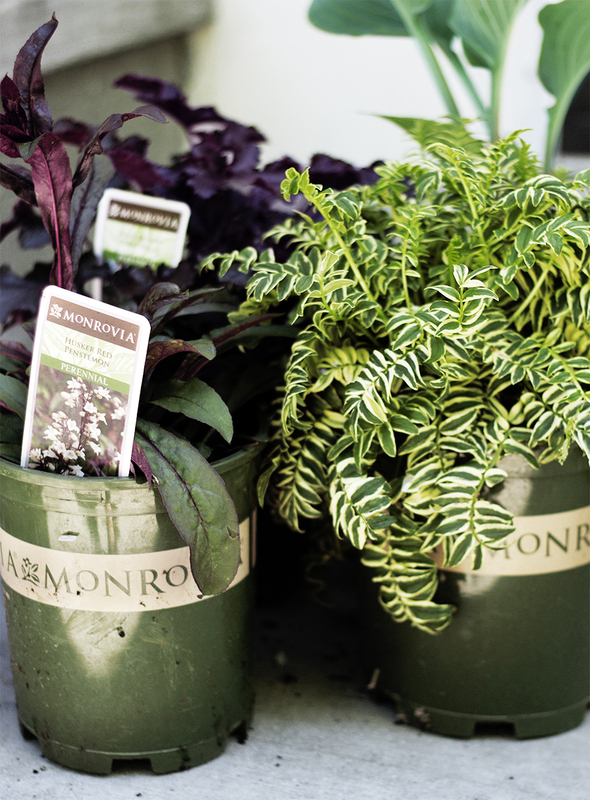 You can also shop Monrovia online and have them shipped to your local nursery if you have your heart set on something specific. 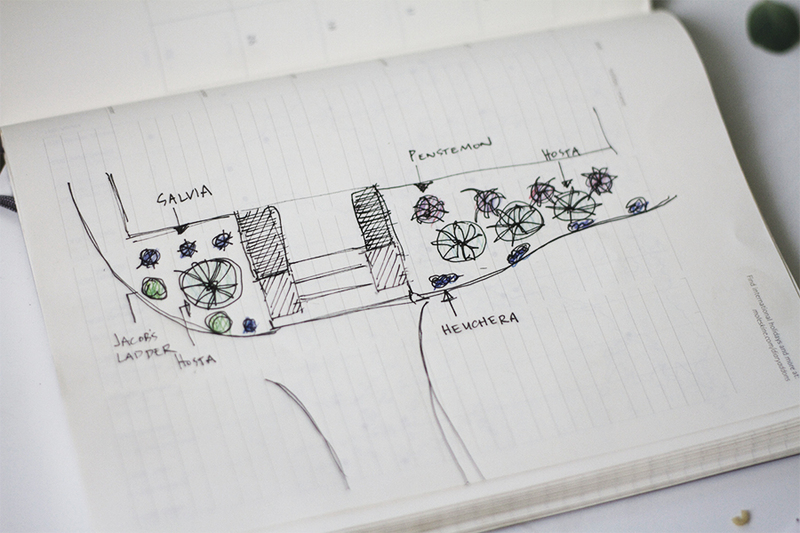 This is a crucial step when planning any garden. Make sure you are paying attention to the height of the plants, especially since when you see them in a garden center or nursery they are usually all about the same size, it can be deceiving. Obviously, I wanted to have tall stuff towards the back of my garden and gradually it get shorter and more petit as it moves to the front. I choose Husker Red Penstemon in the back, Hadspen Blue Plantain Lily Hosta, and Black Beauty Coral Bells (aka Heuchera). I also added a bit of small blue sedum to the very front to fill in and creep over the edging. For the left garden I purchased some large mounding Jacobs Ladder. Guys! I never knew Variegated Jacob’s Ladder came in such large sizes, when this matures it will look make really cool mounds 24″ wide and 18″ tall. 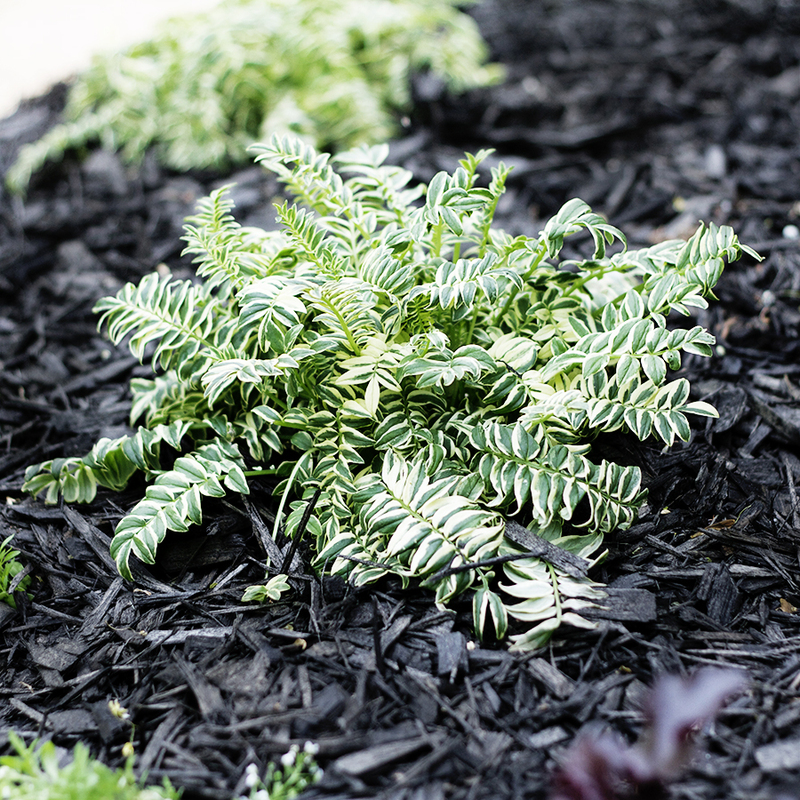 When you are purchasing your perennials, make sure that they will be suitable for your gardens sun/shade requirements. Lots of times garden centers will have all of their sun loving perennials together, while keeping their shade lovers in a covered sheltered section. This makes choosing plants with similar light requirements easier. Having tiered blooming time has been a hard lesson for me to learn, it’s so easy to get distracted by all the pretty blooming plants in the spring. I’m guilty of doing it, and now I have a garden that doesn’t have a lot of bloomers in the mid to late summer. 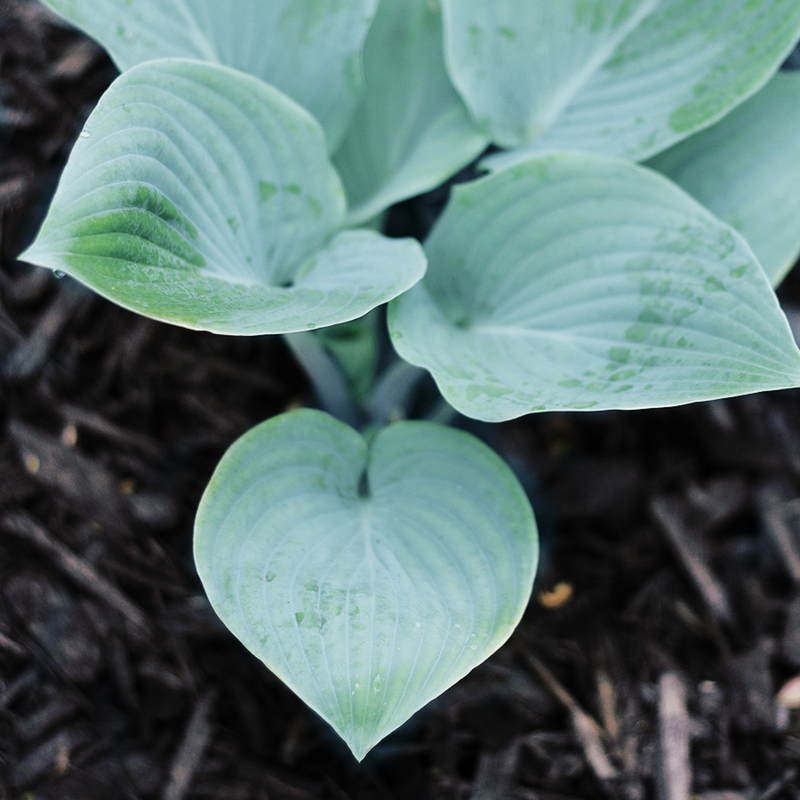 When purchasing plants always be conscious of having staggered bloom times, that way there can always be something interesting and pretty happening in your gardens. When considering a plant, don’t just think of what the flower color will be, but also consider the foliage and texture. I adore interesting and textural leaves just as much as I do a pretty bloom. Make sure to pick plants who’s colors and leaves compliment each other. Make sure you know how much water your new plant needs, you don’t want to put a plant that loves dry sandy soil next to a water guzzler, cause one of them will probs die. Honestly, I just try and stick with plants that need moderate water, ’cause I basically water them all the same and I don’t have time for divas. Best with regular watering- weekly or more often in extreme heat. Moderate growth to 12 inches tall, 20 inches wide. Water regularly in extreme heat for best performance. Fast growing to 30 to 36 in. tall, 12 in. wide. Full shade to Partial shade. 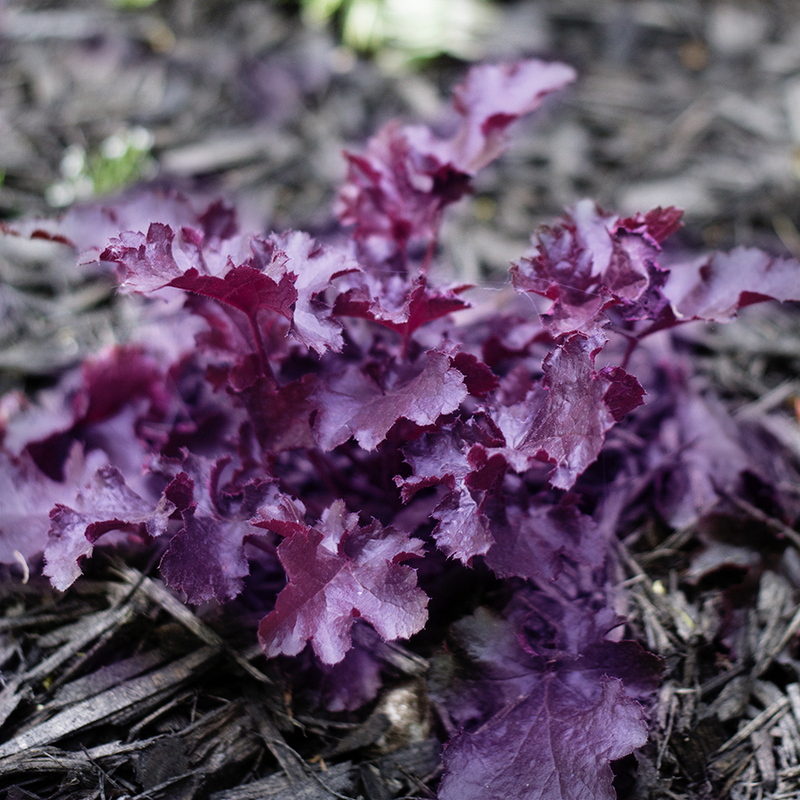 Needs wet or constantly moist soil. Reaches 12 to 18 in. tall and 24 in. wide. Foliage mounds 10 to 12 in. tall, 16 in. wide. Monroiva has got everything, you guys, so even if you’re not planting a huge foundation garden like me, they still have amazing products. Monrovia won’t let their plants ship to nurseries until they meet rigorous quality and size standards. My mom and I got to the nursery just as they received a new Monrovia shipment, it took mom and I all of the will power not to buy the whole truck. Monrovia is sold at most big box stores and a lot of local ma and pop nurseries, click here to find a nursery or garden center near you. do you know if their plants are treated with neonics at any point (seed, soil, whatever)? Hey Monica, you can check out this link for more info. It looks like they do use it, but have highly reduced the amount of what they use by 2/3s over the last couple of years. 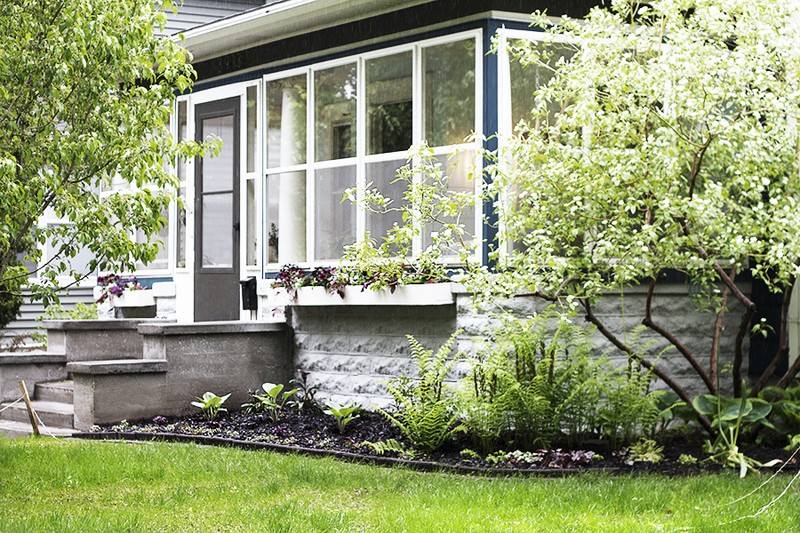 How fantastic to plan a garden and then actually shop for it like that! I am still waiting for the day that I get to do that, as I usually just add sale plants throughout the season. One of these days I am going to be like you Scoops. I was really excited to see that database tool! This is the first time that I have gone to the flower store and purchased all my plants for a garden in one fell swoop. It was pretty exciting to do so! Informatve article, exactly what I needed.